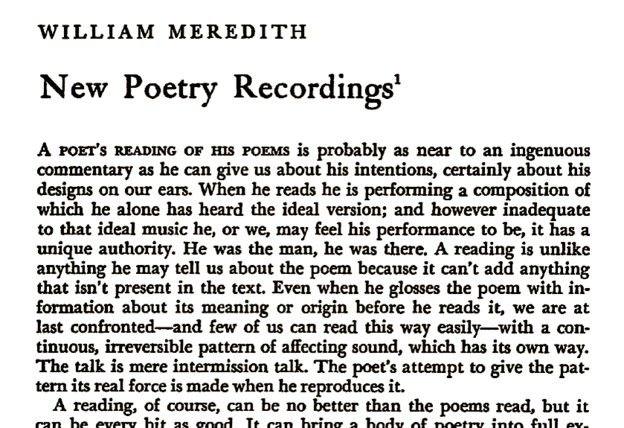 William Meredith’s 1961 essay about then-new recordings of poetry, published in the Hudson Review, starts out with a point I deem apt and true, and then goes on, in my view, to misunderstand pretty much every aspect of such recordings. Naturally, though, it is an important document in the not-very-long bibliography of such writings before, let us say, 1970 or so. I am thus pleased to be making it available here: PDF. His opening point: “A poet's reading of his poems is probably as near to an ingenuous commentary as he can give us about his intentions, certainly about his designs on our ears” (470). Meredith knew very well that such use of poetic intention in 1961 was fraught — in the New Critical heyday — and I'm glad he used it knowingly, because it gives the idea a slight feel of critical difference and resistance: the oral reading of a poem written for the page does "give...intentions" especially — but not only, of course — about oral (and really: aural) design. 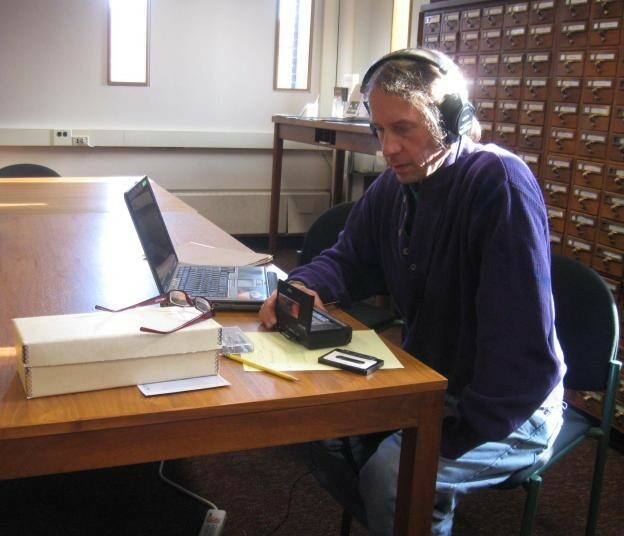 The citation: William Meredith, “New Poetry Recordings,” Hudson Review 14, 3 (Autumn 1961), pp. 470-73.